The definition of grouchy, Kokonoe is nearly always in a foul mood and ready to let anyone know about it. She is stubborn, sharp, and cocky to the point of hubris. However, every vice she possesses is backed by considerable skill and knowledge across many subjects. From metaphysics to bionics and Ars Magus to chemistry, Kokonoe knows it all. 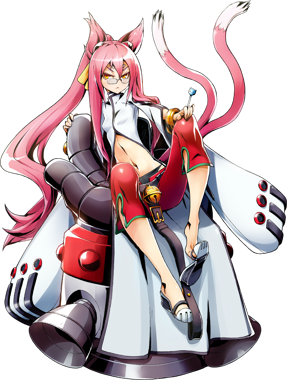 However, science is Kokonoe's true love and she dedicates herself to it. Her dedication is so intense that she often forgoes sleep, and will cross moral lines with little to no hesitation. Kokonoe believes that science is superior to Ars Magus, since there is too little information about and too few studies into Ars Magus, and she believes science is ultimately a safer power. This philosophy of hers permeates Sector Seven. 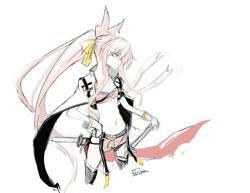 Kokonoe's design from the scrapped story. There were plans for a story that focused on Kokonoe while she was younger. In this story, she would be on an adventure with the objective of killing Yuuki Terumi, and would use high-frequency swords and martial arts on this journey. Unfortunately, it was scrapped as the story was too simple. On February 12th, 2019, creator Toshimichi Mori revealed on Twitter a sketch for Kokonoe's design as well as details concerning the scrapped story in a series of tweets. 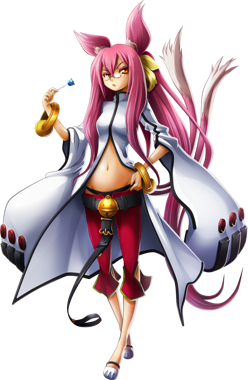 Kokonoe is the fifth DLC character in the series, and the second introduced for BlazBlue: Chrono Phantasma after Terumi.